Heading in for my first day at the new job. Lunch at the cafeteria on the second day. The hiking and bicycling is excellent. Plan your visit. And give me a call if you are in the building. There is so much to learn at work and the new hire administrivia is considerable. I am not quite done unpacking, but I've definitely lost momentum. because I was driving solo. You can follow my route. Click to embiggen and see how many national parks I skirted while driving Interstate freeways 405 to 105 to 605 to 210 to 15 to 70. There are people going around waving yellow "Don't tread on me flags" badmouthing the federal government. They don't want to pay federal taxes or obey federal laws because they don't recognize the federal government or they dismiss it as not doing anything worthwhile. I left Los Angeles at 12:00 PDT yesterday and arrived in Denver at 19:00 MDT today. 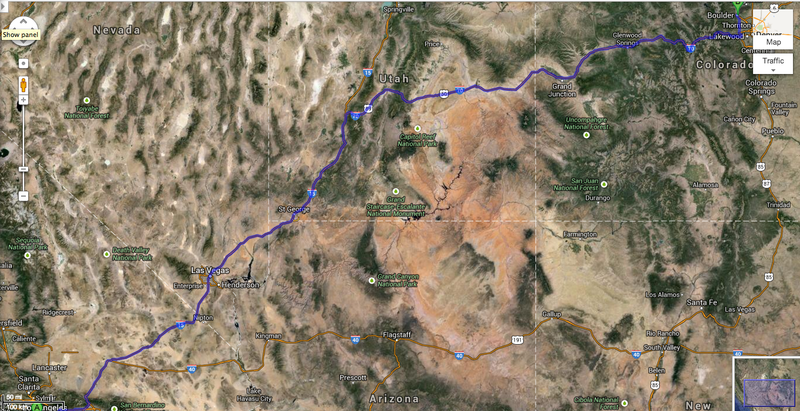 My 1000 mile route crossed sections of California, Nevada, Utah and Colorado. Try doing that with only state and local roads. The federal interstate highway system is an engineering marvel and an economic boon. I found a YouTube video of just one of the stunning sections I travelled these past two days. Although the desert southwest and the rocky mountain range are both stunningly beautiful, they pose uniquely different--but extreme--climatic and geologic challenges for road builders. I am just in awe of the natural scenery, and the human imagination, skill and willpower that it took to raise the money and build these highways. 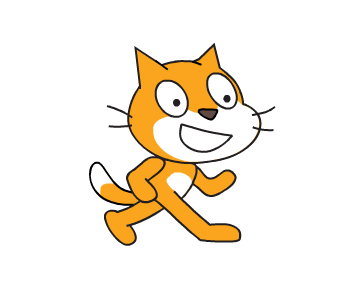 The MIT Club of Southern California is hosting Scratch Day with three family-friendly events in Los Alamitos, Irvine and Mission Viejo. The Irvine location is SOLD OUT. Walk-in registrations at the Los Alamitos and Mission Viejo locations will be accepted on a space-available basis only. While Bad Dad and Iris are bonding over Scratch tomorrow, I will be home packing up my sewing room and clothes. I need help because I am still not fully mobile. The kitchen, office and linens are mostly packed. The bathroom stuff won't take much time. I could really use a hand (and legs!) to help with my sewing and craft stuff tomorrow. Email and/or leave a comment if you can join me in my Redondo Beach home to sift through my sewing stuff. How about we take a physics-based approach to the Idaho Stop controversy? Recall that the Idaho Stop only applies IF THERE IS NO ONE ELSE NEAR THE INTERSECTION who has the right of way. Since the amount of damage inflicted upon others is proportional to the momentum, let's set a small--but non-zero--maximum limit to the minimum momentum of travelers approaching intersections. a pedestrian needs to slow down to 1.4 m/s or about 3 mph when approaching a stop sign. a bicylist needs to slows down to 1 m/s or about 2 mph. an automobile needs to slow down to 0.05 m/s or about 0.1 mph. A quick survey of cars at the nearest stop sign to my home shows that most cars exceed this threshold by more than a factor of 10. When commuting or running errands in the city, I bike 5-15 mph (hills!) so slowing to 2 mph wouldn't be burdensome. Most city pedestrians walk at 3-4 mph; they barely need only slow slightly for stop signs IF NO ONE ELSE IS NEAR THE INTERSECTION. If others are near the intersection, then the normal rules of total stop (zero momentum) and right of way assignment apply. I hope you are enjoying Los Angeles' Bike Week. LA Bicycle Coalition and MTA have planned a full roster of events. I hope you have a chance to get your bike ready for bike to work day and beyond. If you ride your bike, you are very aware of how much energy it takes to stop and start. Because most arterial roads lack a safe place for bicyclists to ride, bicyclists are relegated to slower side roads with many stop signs. Why do we have to come to a complete stop and put our feet down at each and every stop sign, even when there is no traffic in the cross direction? Why is it called "Idaho-Style"? If we make it easier for a 200 pound rider and bicycle combo to get around, perhaps we can convince more people to get out of their 4,000 motor vehicle and ride a bike instead. Remember my Vortex Street cardigan refashion? I was reminded of it when I saw this animation of a von Kármán vortex street downwind of Madeira Island on the CIMSS Satellite Blog. I've been packing books and files this week. The boxes are getting too heavy for me to handle. Do you think that it would be okay to lighten the boxes by mixing books with yarn and sweaters? 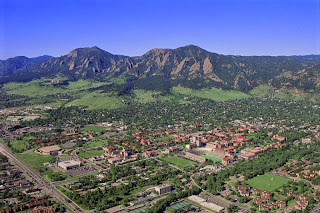 Aerial CU picture via here. 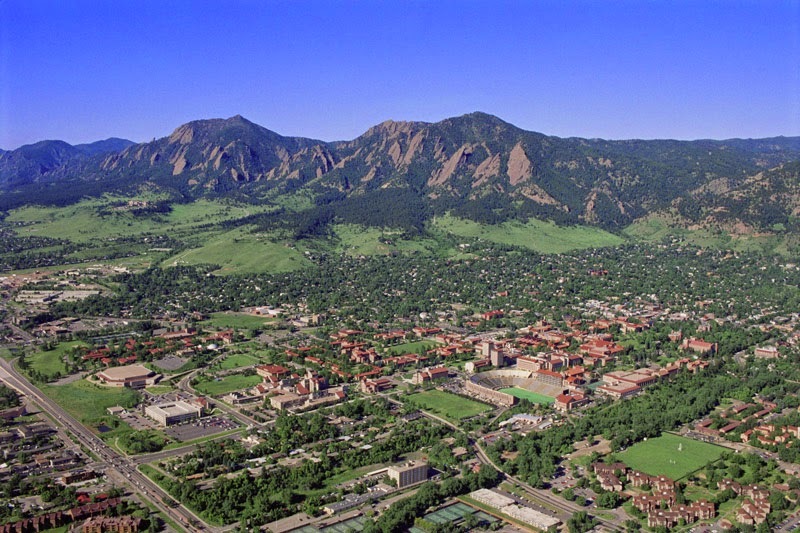 The last time I moved to Boulder , I shipped my books via USPS media mail, packed up six boxes of things I would not need right away and sent them via a UC Berkeley classmate who was also heading to Boulder for graduate studies*. The rest of my stuff fit in my little Mazda 323. There was even enough room to bring Bad Dad along to help with the drive and housing search. Why do I have so much stuff this time around? And who gets the kitchen appliances? How much cooking will I do just for one, Bad Dad asks. I plan to cook in large quantities and trade leftovers, of course. My new office is in the lab at the top of the mesa in the upper left hand corner. It is small, but it is mine and has a window. My new apartment is at the base of that mesa, by the shuttle stop so I don't have to drive or bike UP the hill. I may bike down the hill for fun, though. Not much sewing is happening, but I will try to post some refashions I made in January. * There is a joke about a Berkeley--Boulder--Cambridge pipeline for physical scientists and Bad Dad has done time in all three. I paid my friend $$ to help with gas for his UHaul trailer so he transported my bulky winter clothes and burgeoning fabric and yarn stash. It was just a handful of boxes of books and 6 boxes total winter clothes/fabric/yarn back then.